After starring as Jean Valjean in London and in the epic 25th Anniversary special, Alfie Boe finally thrills Broadway audiences with his passionate, soaring Les Miserables performance (but only for a few months longer so get over to the Imperial Theatre). In addition to being one of the world's most beloved Valjeans, Boe is a Tony Award recipient for his work in Baz Luhrmann's La Boheme. Below, BroadwayBox talks to the British star about where he keeps the prestigious award, the "Bring Him Home" that changed it all, and his passion for cooking. 1. What's your warm up like for the show now? Well having trained as an opera singer, I have a very specific regimen that I do with my voice—certain scales and exercises that get it into the zone, if you will. I don’t warm up too much; I don't over-sing. There are some singers that tend to warm themselves up like crazy and that works for them, but for me I tend to do 10 minutes just accessing the voice, making sure it’s fluid. Plus, I’ve been using it all day long so by the time I get to the theatre it’s relatively warm. Also, this schedule helps keep your voice constantly on target. 2. Tell me about a moment in Les Miz 25 that I would never know about unless I was part of it. I was so focused on the show and what I had to do and what I had to achieve, I didn't really think of where I was and the grandeur of the night. Before I went out to sing “Bring Him Home”, I stood at the back of the barricade and got down on my knees and prayed like crazy. I knew that was going to be a moment for me to turn things around for myself. Then when I walked offstage Matt Lucas, who played Thenardier, came running up to me and said “A star is born tonight.” And I looked at him and said, “Who?” I didn't quite get it. I was so engrossed in what I was doing I didn't separate out of it until the end of the finale. When the encores came I was a different performer. 3. Where do you keep your Tony Award? That's actually in my office. It’s among a couple of other things. I don't tend to put things on display too much. I don't put records or posters of myself on the wall. I sort of keep them locked away unless someone is interested in seeing it, then I’d show them. I’m very proud of it though. 4. Growing up in fishing port in England, what was your introduction to music and opera? My first introduction was through my father. My dad used to play a lot of old operatic tenors. We had a record player and he would put the 78 records on during the Sunday meal—singers like Beniamino Gigli and Richard Tauber and Enrico Caruso— and I remember that from a very early age. Then as I got older, my brother was into opera and Maria Callas and he started collecting his own records, and I would listen to them as well. Inevitably in a small house with nine people in it, you can’t avoid it. You’re listening to everyone else’s music, and that’s how I learned and experienced different types. 5. Outside of music and performing, what are you passionate about? I like to exercise a lot. I just bought myself a bicycle—so that will keep me fit around the city. I love to cook. I spend a lot of time in the kitchen entertaining friends and family. I’ve got a few [signature dishes]. I do a good shepherd’s pie, I love my roast dinners; I grew up on roast dinners so I like to cook them for myself and my family. I also love Italian food so I do that occasionally. I like to follow chefs on TV and get advice from them. 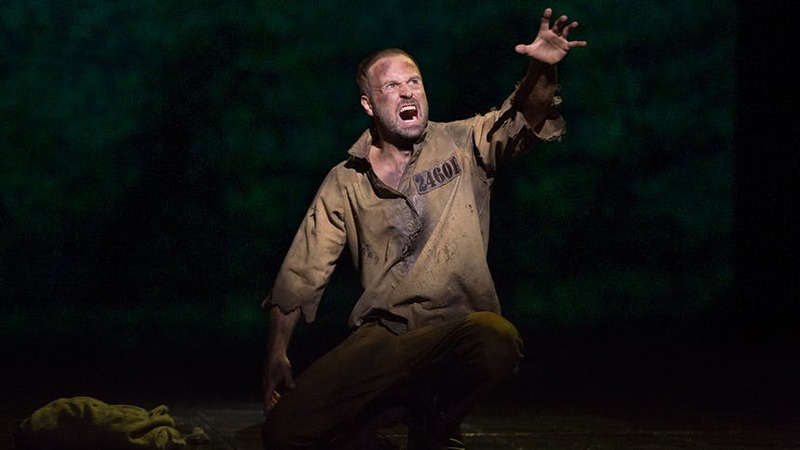 See Alfie Boe blow the roof off Broadway's Imperial Theatre as Jean Valjean in 'Les Miserables' through February 28, 2016.